Even though I'm running a half marathon this weekend (by the way, thank you all for sending me encouragement and wishing me luck! I really appreciate it!! ), I'm already looking forward to the rest of the races I have planned for the rest of the summer. Summer is my favorite time to run and race, so I always load up my calendar in June and July! 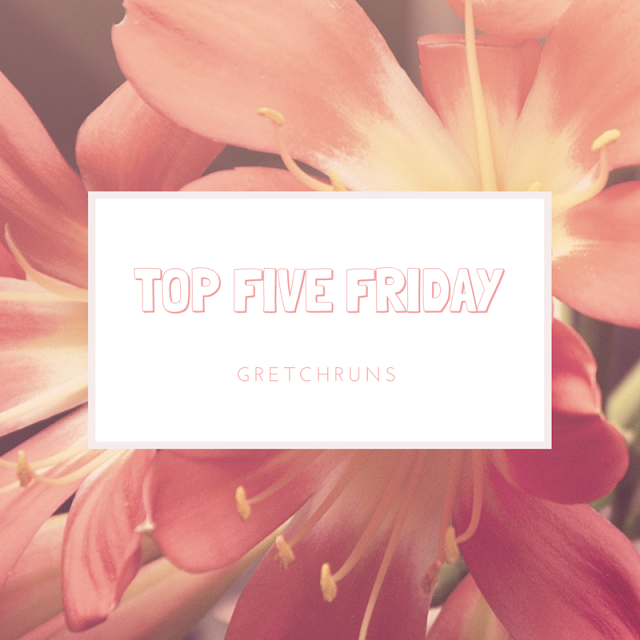 As part of the Friday Five linkup, today I'll share what five races I have on my radar, as well as other favorites of the week! If you're a fan of running hills and running in the evening, this is the race for you! I grew up running this course and I'm looking forward to participating this year. The race fee is low ($15) and it's a very small race in a beautiful park! What could be better? I've never done this race before, but it's so much fun to watch! Dan and I might be running this year, and I'm excited to race my first outdoor mile. I've never even done a time trial outside of the track, so this could be VERY interesting. I know that if I don't sign up I'll at least show up to cheer on the runners. The atmosphere is the best! Another beautiful race in different city park. This one is interesting because half of it runs around the neighborhood of Regent Square, and the other half is a downhill course in the woods. It's so much fun and there's a great post-race party! Make sure you sign up soon because this fills up FAST. First of all, the name of this race is great, and it seems like a lot of fun! It's a night race with a huge party starting before the race even begins. The only downside is that the race course is a small loop that you have to run four times. Running past the finish line and having to keep going is never easy for me! This is supposed to be a flat and fast course, and also one of the prettiest half marathons in the country. It's a short drive from Pittsburgh, and I'm looking forward to my first half marathon in Ohio! Has anyone ever done this race and have tips? This was an interesting week with the first team challenge, and a very one-sided competition! There are a lot of chefs that I think are annoying and wouldn't mind leaving soon (cough cough KATRINA) and a few that are standing out to me (Derrick!! Amanda! Hetal!) Also, did anyone else think that almost all of those cinnamon rolls sounded disgusting? I wouldn't like prunes or pistachios in my rolls! What's wrong with a basic recipe...keep it simple people! I'm still not sure how I feel about the twist this season (street vs. stage) and I'm interested to see how it'll play out in the live shows. What I AM sure about is that I love Jason Derulo as a judge. He's not only one of my favorite singers at the moment, but also seems like the sweetest guy ever! Another crazy episode. The show seems to be focusing less and less on the actual "relationships" forming and more on drama (the whole Clint/JJ thing was really stupid and unnecessary, and I dislike both of them!) On the other hand, how sweet are both Ben Z and Ben H? Who else agrees with Tony that the dates should just be to a zoo instead of sumo wrestling?! Did anyone else watch the premier? I loved it! I don't know if that's why I think this season of the Bachelorette is so irritating, but I find this show really funny and (probably) spot-on to what happens behind the scenes. It almost seems like a documentary, and I can't wait to see what happens later in the season! Different style of song for Pitbull and I love it! Fun song for the summer. Yesterday I was walking around downtown at lunch, and there was a band playing this song. It made me so happy and seemed like the perfect summer song for the beautiful days we've been having lately! I guess I'm in a country mood this week, because I'm loving this song as well! Dan sent it to me yesterday and I can't stop listening to it! This singer is SO talented, and her songs are really beautiful. I found her on iTunes under Artists to Watch, and I'm so glad I stumbled on her! Classical piece for the week. This song is so beautiful and relaxing. I love piano pieces that have strings in the background, and this is a great piece to listen to at work. If I saw the finish line I'd want to finish. The second half I did took us by the turn to the finish line, which everyone could see since it was a straight shot down the street, and I wanted to jump the barrier and just get there. Haha I always feel that way during the Pittsburgh Marathon..when the two races split up I always want to go with the half-ers! I always love your round-up of favorite shows and music! I am not watching any of the same shows at the moment, but I will say Jason DeRulo was one of my favorite mentors on Idol this year (lots of thoughtful, interesting feedback to the singers) so I am not surprised he makes a great judge on SYTYCD! Thanks Gina!! I'm glad Jason got a full-time gig..he's a lot better than most of the current judges on shows. He also isn't afraid to interact with the contestants and make a fool of himself which is great to see! Same with me..I don't feel like it's real at all any more or feel any connection to any of them! I wish she could send them all home. omg bach! that episode this week was SO odd. ugh. chicken fried is one of my favs. have a great weekend! Goodluck this wkend in your half. You have alot of races coming up this summer. So exciting! I do the Liberty Mile with my kids every year. It's so fun. I love MasterChef, but admittedly I miss Joe. I do not like the new judge. Other than that, I'm loving this season so far - such a diverse group of people! I know you'll have a great race because you've trained so hard! Good luck - I can't wait to hear about it. Joe was the best!! Christina is fine for me..but I never really liked Graham that much. I hate the staring-off-in-the-distance thing he does when he tries food. So annoying! I've been watching the Bachelorette....people are nuts!